Conga-bob is a 69-year-old, local musician in Sarasota, FL who last logged in over a month ago. 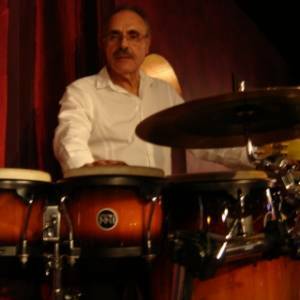 Bob Brillon is a local Sarasota percussionist specializing in Latin Jazz and Popular music performances with special emphasis and interest in ethnic acoustic percussion works. Brillon’s musical talent is rooted in the African, Cuban, Puerto Rican, Brazilian, Classical Spanish and American pop percussion. Each culture offering defined percussion beats and rhythms, creating an exciting "signature" sound to tap into. 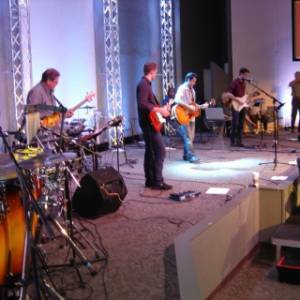 Brillon can be experienced live every Sunday morning performing with his primary modern worship band in the Garden at Church of the Palms on Bee Ridge Road in Sarasota, Florida. Brillon can accompany solo acoustic guitars, keyboard players, vocalists or small Latin/Jazz ensembles, expanding into Pop / Rock Bands or full range Pop Orchestra accompaniment. Brillon provides the essence of many colors in his percussion artistry by manipulating the background sound effects that set the mood, tempo and grove of any musical composition. As a musician, Brillon often creates and writes his own rhythmic parts to set the proper grove and dynamics needed. This is done in close collaboration with the primary Musician, Soloist or Music Director that establish the main theme or message of the musical piece to be accompanied. The timbre of different percussion sounds, color and depth and how to incorporate them all into a particular theme is what defines Brillon’s percussion skills in true accompaniment. 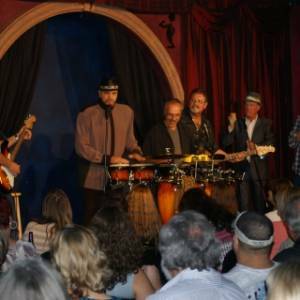 With such a wide assortment of percussion sound, Brillon can bring out the dynamics and rhythmic foundation of any music genre, including: Pop, Latin, Tropical, Salsa, Soft Jazz, Christian Contemporary, Classical Spanish Guitar, Soft Rock and Rhythm & Blues. 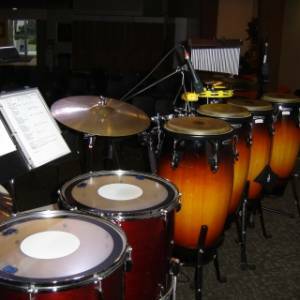 My percussion arsenal consists of the following: Four Octave Latin Congas on stands for full range and versatility; Bongo set on stand for higher pitch solo parts or accenting; Two to four octave floor Tom-Tom Kit for acoustic tympani style sound; Percussion Table with an assortment of hand held sound-effects; Wood Jam Block; Maracas; Hand-Cabasa; Single and double stroke foot pedal Cabasa for hands-free accompaniment while driving the rhythm on the congas; Metal and natural hand Shakers; Various cowbells; Mounted tambourine; Triangles; Wind chimes; Bell tree; Orchestral quality suspended cymbals (18 and 20 inch medium ride); China Splash cymbal for closing effects.